The controllers for GSM remote monitoring work over mobile networks. Correspondingly, they use GPRS, 3G, and 4G (LTE) as the main communication channels for GSM wireless for remote connections. These controllers are used, not only in places without Ethernet (LAN) connectivity but where there are special requirements for mandatory connectivity over mobile networks. GSM GPRS controller - micro controller based device for monitoring and control via the GSM network. The controller has 2 digital inputs, 2 analog inputs, 1 Wire interface for up to 4 Teracom humidity and temperature sensors. It also has 2 relays with normally open and normally close contacts. Remote control – the relay outputs can be controlled with SMS, HTTP command or by a single call from authorized number. Temperature & Humidity control – supports Teracom TSTxxx (temperature) and TSHxxx temperature & humidity 1 wire sensors. The relay outputs can be controlled from the value of the measured parameters. The minimum, maximum and hysteresis values can be set during the initial setup (via USB) or by SMS. Status reporter – SMS and email alerts can be sent to the authorized recipients. The alerts can be triggered if some of the measured parameters (temperature, humidity, analog inputs, digital inputs) is in alarm state. SCADA systems – controller is designed for easy SCADA systems integration. Using PUSH function makes it possible to build systems where many controllers from different places are sending data to a remote server. 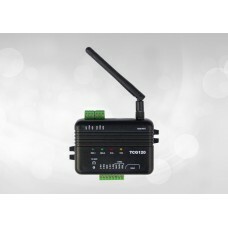 GSM GPRS Controller - TCG120 is a micro-controller based device for monitoring and control via the G..